What are the latest trends in the popularity of different marketing communications channel tactics? The DMA’s 2015 Response Rate Report provides answers. Periodically, the Direct Marketing Association conducts field research to take the pulse of marketers and the various channels they’re employing to support their marketing campaigns. 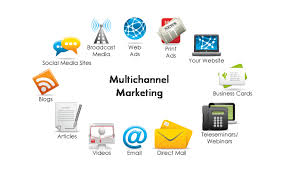 Clearly, the research findings show that marketers are using multiple channels in their campaigns: Two-thirds of the survey respondents use more than one channel, and around 45% of them reported that they’re using three or more channels in their promotional campaigns. 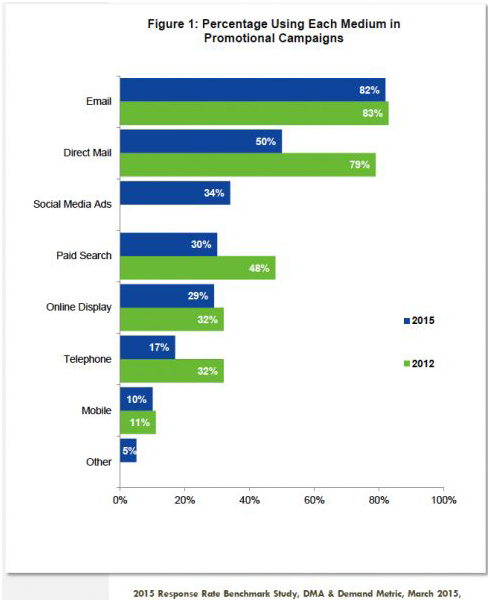 Social media advertising is a new entrant on the list in the DMA research. It wasn’t even included in the DMA’s 2012 survey, yet today appears to be an important part of the channel mix. On the other hand, mobile marketing remains a channel that isn’t being utilized by very many marketers — at least not yet. In a similar survey conducted by the DMA in 2012, its adoption rate was similar to what the 2015 survey has found. The graph below compares 2015 and 2012 survey results. Aside from the lack of movement with mobile marketing, another interesting trend is the significant decline in the utilization of direct mail marketing. Back in 2012, it rivaled e-mail marketing in popularity. Today, only half of the marketers surveyed continue to use it as a marketing channel. And a third big trend is the utter collapse of telemarketing as a popular MarComm channel — likely happening under the twin weight of high costs and massive phone message filtering. In terms of future anticipated usage, the DMA research found that marketers are, in fact, warming to mobile marketing. It and social media advertising are the two channels that have the best prospects for new adoption, based on the future intentions reported by these respondents. The 2015 DMA report is available for purchase here. Drivers are more worried about distracted drivers than drunk drivers. HR managers' views of new college grad hires: Curmudgeonly … or canaries in the coal mine? Are U.S. warehouse jobs destined to go the way of manufacturing employment? Is the future of printed books written in disappearing ink?